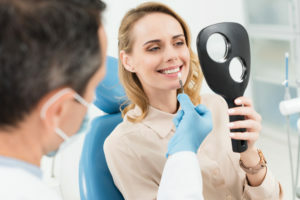 You are about to make the ideal connection if you are interested in a dental implant in Pembroke Pines or Miramar, Florida. In addition to these communities, if you reside in Davie or Southwest Ranches, dental implants are within easy reach. We set the standard for cosmetic dentistry in this area, and we bring a number of attributes to the table that set us apart. Our dentists are sincerely committed to the health and well-being of our patients. You will recognize this from the start, and our team members go the extra mile to make our patients feel comfortable on every level. We treat people the way that we like to be treated when we go to a practitioner, and this is why our practice continues to grow as people spread the word about us. The dental implants Southwest Ranches, Davie, and Cooper City area residents can receive from us can have a transformative effect if you have missing teeth. If you come in for a dental implant consultation, one of our dentists will evaluate the bone density. Even if it is insufficient, in many cases, a buildup can be utilized to prepare the area for dental implant surgery. When it is time to take the first step, a titanium implant will be placed into the upper or lower jawbone. It is given time to fuse with the bone; this will typically take somewhere in the vicinity of four to six months, but the time frame will vary. When it is firmly set, a healing collar will be applied to aid in proper gum healing. After a couple of weeks, an abutment is connected to the dental implant, and the crown is ultimately attached to the abutment. Going forward, the new tooth and the way it connects to your jawbone will feel completely natural, and to others, it will look exactly like the real thing. We often hear one regret after our Pembroke Pines area dental implant patients that go through this process. They express that they really wish that they had done it sooner. If you have been considering a dental implant as a Cooper City, Davie, Miramar, or Southwest Ranches resident, now is the time for action. You can request an appointment if you send us a message, and we can be reached by phone at 954-589-0292.